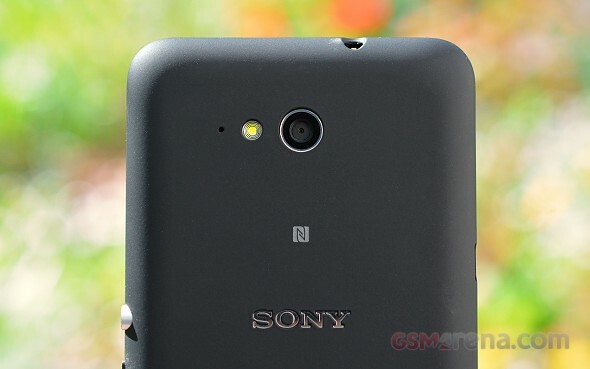 The Sony Xperia E4g's camera uses a 5MP camera sensor - a resolution, which sounds quite outdated. It shoots with a maximum resolution of 2560 x 1920 pixels (5MP) in manual and Superior Auto modes. There is also a LED flash to help you with some low-light photos. The camera should be the same as the one on the Xperia E4 even though the flash position has been swapped, so perhaps there have been some minor changes. The volume rocker can be mapped to serve as a shutter button, which definitely helps while shooting. The camera interface consists of two panes and is unified with the camcorder one - you can snap a photo or shoot a video without changing modes most of the times. While this is convenient, framing your videos correctly is nearly impossible as they have a different field of view and you only get to see it once you start recording. In the full resolution Manual mode you also get access to "manual controls" on the viewfinder, which sounds more impressive than it really is. There's an exposure compensation slider and a white balance selector. You can also control the ISO, metering and focus modes, turn on/off image stabilization, but those are buried in the settings menu. You do, however, get a dedicated video mode, with a proper viewfinder with manual control, which is nice to have. 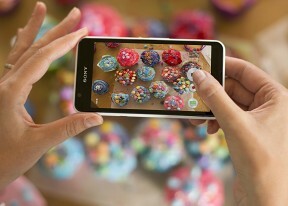 The Superior Auto shooting mode is what we've already seen in other Xperia phones. There are no settings you can change, everything here is done automagically. Manual and Superior Auto aside, the Xperia E4g offers several other interesting shooting modes. There's Sweep panorama but, unfortunately, panoramas come out with 5MP resolution, lousy stitching and uninspiring quality. Then, there are the Augmented Reality effects, which stamp one of several virtual worlds over your scene and you can even move around in this world thanks to some intriguing motion tracking effect (note that it needs real-life visual cues in the scene to track your motion). Children will love this mode, but us bitter adults are unimpressed. Other modes include the regular Picture effect mode, which creates a 3 x 3 grid that shows all the available effects in real time. Sony has also included a mode called Social streaming, which can live-stream the video feed from your camera directly on your Facebook wall. That's certainly not something you see every day. There is also a YouTube live streaming option to sweeten the deal. Timeshift replaces the regular burst mode, it captures 30 shots in just 2 seconds. The intriguing thing is it starts shooting even before you've pressed the shutter button. Samples, taken with the Xperia E4g came out with underwhelming level of resolved detail when viewed at 1:1 magnification. The exposure, contrast and colors are good, which makes for nice looking photos when you view them fitted within your screen. Getting any closer however shows that the noise reduction algorithm has taken its toll on the fine detail, while the noise still remains high in some images. Furthermore, there are significant oversharpening artifacts visible. The dynamic range is low, too. Interestingly enough, the Xperia E4g seems to perform even worse than the Xperia E4, especially while shooting at low light. While Superior Auto would occasionally activate the HDR mode, if you really want to force it, you'd have to go to Manual mode abd select Backlight Correction (HDR) from the Scenes menu. The good news is the HDR mode is conservative and rescues both the highlights and shadows without going to extremes. Unfortunately, the resolved detail is even worse than in the standard samples, but, for what it's worth, HDR works pretty well given the hardware limitations. We uploaded the full resolution 5MP photos to our photo quality comparison database to compare against other high-resolution smartphones. The image quality - resolved detail, noise, colors and contrast - are below average, but you can't really ask much more, given the hardware. The Sony Xperia E4g is capable of capturing 1080p video at 30fps, which certainly is not as outdated as the still camera resolution. The camcorder shares the same UI as the still camera, unless you go into manual mode. In manual mode you can set a timer and fiddle with settings like exposure, metering, focus mode, etc. For videos the Xperia E4g features digital image stabilization, but there's a price to pay - the field of view (FoV) is reduced (it's how all digital stabilization systems work). Also, it takes a huge toll on the quality. The phone is smart enough to detect whether you are shooting hand-held or you have rested it on something stable but you get the reduced FoV either way if the option is turned on. If you go into video mode from the Manual shooting mode, you get an HDR option, as well as various preset scenes to pick from. You can also snap stills during video recording but those come out in 1080p resolution. The Sony Xperia E4g's 1080p video samples are nothing to rave about, but they are still better than the still images. The resolved detail is better, the noise reduction isn't as destructive and there is very little noise. The frame rate is around 29 fps, while the bitrate is good at 16-17Mbps with stereo sound recording with a bitrate of 128 Kbps and 48 kHz audio sampling rate. Rather surprisingly, autofocus was pretty laid back unlike most other Xperia phones we have reviewed and hardly hunted for focus while video recording. This was also the case with the Xperia E4, so, there might be a good trend starting right there. Here's a 1080p sample, which we've uploaded on YouTube. And here is an untouched 1080p@30fps video sample (10s, ~21MB) for you to download. The Sony Xperia E4g captures mediocre 1080p videos. It manages to resolve good detail in our resolution chart test and under good light conditions, but there is lots of noise and artefacts when shooting in low-light rooms, even more so than with the Xperia E4.